Hydro Ottawa is a for-profit company, wholly-owned by the City of Ottawa, that distributes electricity to customers in the City of Ottawa and the Village of Casselman, generates renewable energy and provides energy conservation and infrastructure management services. Faced with an increased wave of retirements and the need to plan for next-generation leadership, Hydro Ottawa, which is 70% unionized, had begun examining and exploring talent development opportunities for its employees. Canadian Management Centre has a longstanding and trusted relationship with Hydro Ottawa and we were asked to refresh our previous management training programs to ensure they would meet the needs of the utility's next-generation leaders, in alignment with its strategic direction. Thanks to our proven, turnkey programs, we were able to create a robust curriculum with limited customization – saving the utility time and money. 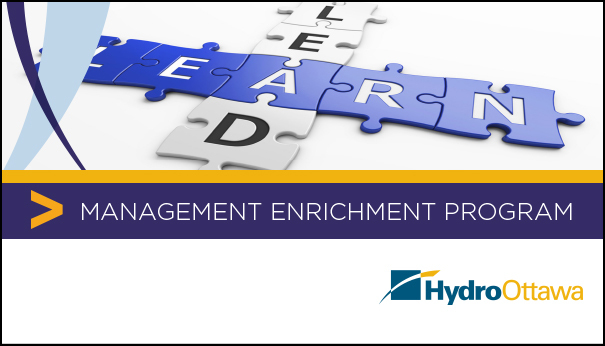 Partnering with Hydro Ottawa, we launched a new Management Development Program designed to be modular, flexible and to bring cross-functional leaders together. The solution was designed to provide development programs to support emerging and new people leaders for success. It also strengthened currently available foundational programs and improved delivery timelines by allowing ready access to skill development programs by those who need them when they need them. By Hydro Ottawa investing time to familiarize our Facilitators with their culture, mission, vision, values and strategic direction, we were more easily able to adapt the programs to participants' needs and ensure they had an impactful learning experience. Uptake of these programs has been strong, with participants seeing clear opportunities to quickly apply key concepts to improve their individual and team effectiveness.